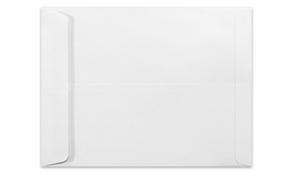 Looking for wholesale envelopes? Are you a printer or part of the trade? Register for a wholesale account or learn more. Already have an account? Log in to see your discounted pricing. 9 1/2 x 12 1/2 catalog envelopes in 28lb. bright white paper. The closure is a standard moisten to seal gum found on most envelopes. Latex "quick stick" or Peel & Stick can be added to make sealing easier. Have a wholesale account? Log in to see your discounted pricing. This item doesn't have any reviews yet. Be the first to write a review! Have you seen our blog? I received my order of specialty printed envelopes and I am very happy with the way they turned out. Today, I received your company’s invoice in the mail, showing my balance, etc. On the outer envelope (the invoice came in), I noticed the insignia God Bless America. I appreciate your company’s pride and boldness in displaying the words God Bless America on your materials! Even if I were not 100% pleased with my product, for this fact alone, I would use your company again. Thank you for supplying a superior product and displaying a superior label! © Copyright 2018 Envelope Superstore ®. All rights reserved.